ThinkiOS reports (via 9to5Mac) that it has received a pair of drawings claimed to be of the "iPad mini" from a source in China. The drawings are rather simplistic in nature, and several other inconsistencies make it difficult to believe that they are genuine drawings based on the actual design of the rumored product. The most glaring inconsistency is the aspect ratio of the display on the drawing, which we estimate at very close to 1.40. The iPad mini has been rumored to be adopting the same resolution as the non-Retina iPad, which uses an aspect ratio of 1.33. 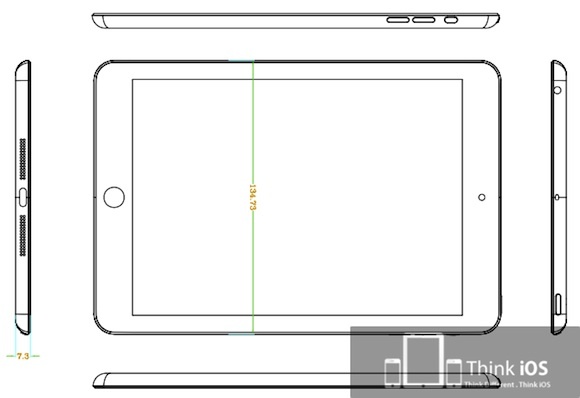 Overall, the drawings show the size of the iPad mini at 200 mm by 135 mm, with a thickness of 7.3 mm. This compares to the 241 mm by 186 mm size of the current iPad models, with the third-generation iPad measuring 9.4 mm thick and the iPad 2 measuring 8.8 mm thick. 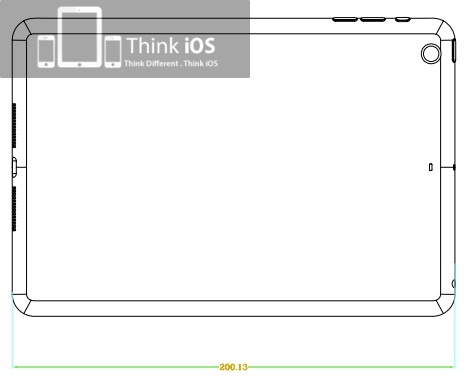 ThinkiOS claims that the iPad mini carries a 7-inch display, although our counting of the pixels when scaled to the stated measurement of the device yields a display of roughly 7.8 inches, closer to the 7.85-inch display that has been rumored for some time. Earlier this week, another case maker's model of the rumored iPad mini surfaced, with pixel counts of the photos estimating the device's size at a slightly larger 213 mm by 143 mm. Unlike the earlier photos, however, the new drawings surfacing today are accompanied by photos of cases that are actually being produced based on the design. 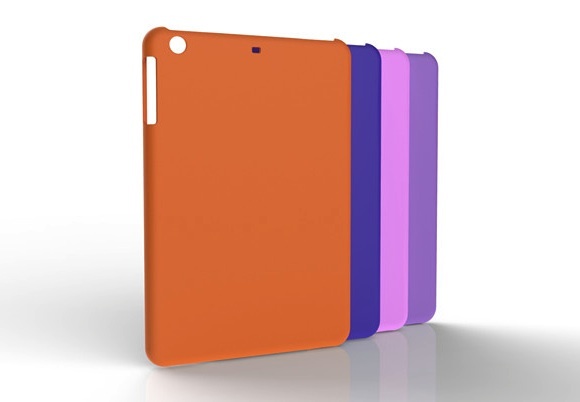 The cases are being manufactured by Fullhull, a case company based in Shenzhen, China where Apple's manufacturing partner Foxconn has major assembly facilities. 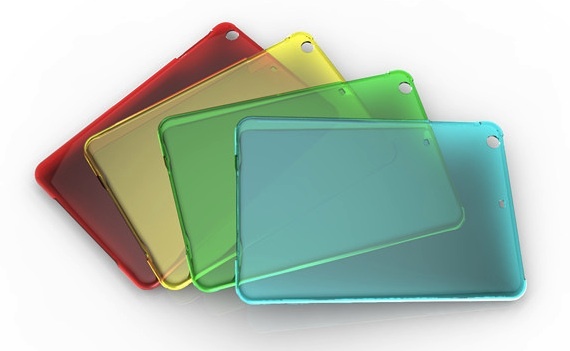 Case manufacturers have become increasingly willing to begin production on cases for rumored products based on speculation and leaks, hoping to benefit by being among the first to hit the market following the actual launch. But as was seen last year with the tapered iPhone design for which numerous cases were circulating, those bets do not always pay off. It's hard to tell of course if this is legit or not, but a smaller iPad may be a fun product to have for those that want a smaller version of an iPad, but not something as small as an iPhone. If priced right it would take a big bite out of the smaller tablets out there. If these are legitimate drawings of the real deal then it looks like it would be difficult to hold in portrait model. There is no enough bezel on the sides to rest your thumbs. It's for phones because we can grip the entire phone with one hand but that's not possible even with a smaller tablet so there needs to be an ample amount of bezel on the edges. The current iPad could shave 1mm on each side it still have enough room to grip but more than that would be an ergonomic nightmare. I don't know about anyone else, but I don't usually hold my iPad with my thumbs. I find it far more comfortable to sort of cradle it in my hands, with my fingers supporting it underneath and the sides lightly pressing into my palms. The most glaring inconsistency is the aspect ratio of the display on the drawing, which we estimate at very close to 1.40. The iPad mini has been rumored to be adopting the same resolution as the non-Retina iPad, which uses an aspect ratio of 1.33. *yawn* this single fact alone disproves the entire thing. Case manufacturers have become increasingly willing to begin production on cases for rumored products based on speculation and leaks, hoping to benefit by being among the first to hit the market following the actual launch. When people are willing to pay $20 - $40 for a $0.30 piece of silicon it's worth it to be first to market. If this was a good idea, Apple would have already done it and the nexus would be following.